Thursday, November 13, students from Colorado State University’s Brewing Science and Technology course gathered at Odell Brewing Company’s Tap Room to celebrate the release of their class beer, Hoppy Days IPA. The class, along with Professor Jack Avens joined Doug Odell on October 25th to brew the beer on Odell Brewing’s five barrel pilot system. 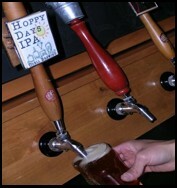 Hoppy Days IPA is the third beer brewed at Odell Brewing by the CSU class which is now in its fourth year. “This is a capstone event in the total course learning experience for these students, and it exemplifies the continuing cooperation of Odell Brewing Company in the education of students at Colorado State University,” said Professor Jack Avens. Hoppy Days IPA, an American style IPA, was first developed and brewed by the students in class at CSU on a ten gallon brewing system donated by Odell Brewing Co. 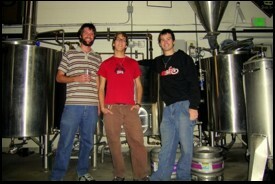 The recipe for the ale, which features generous amounts of Columbus, Amarillo, and Centennial hops, was then modified to be brewed on Odell Brewing’s pilot system. Eli Kolodny, a student in the class and avid homebrewer said, “Brew days in lab and at Odell’s were my favorite because they afforded us the opportunity to experience brewing on both a smaller and larger scale.” Kolodny, who came up with the name Hoppy Days, will be a brewmaster for the class next semester. Hoppy Days IPA will be available at Odell Brewing and at CSU’s Ramskeller beginning November 14th.